For testimonials from our low vision patients, click here. Low vision is partial vision loss which varies from person to person. Depending on the severity and type of vision impairment, the patient may have some useful vision. Typically the impairment includes a significant reduction in visual acuity to worse than 20/70, hazy, blurred vision, blind spots or significant visual field loss and tunnel vision. Sometimes the extent of vision loss is considered to be legal blindness (20/200 or less visual acuity in the better eye) or almost total blindness. 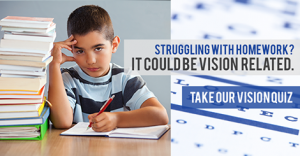 Since the vision loss can’t be corrected, low vision requires significant adjustments to daily life and the help of techniques and specialized low vision aids to help you maximize your remaining vision to increase independence and quality of life. Eye diseases such as: glaucoma, macular degeneration, cataracts, diabetic retinopathy, and retinitis pigmentosa. Eye injury or brain injury. This is one of the most frequent questions our eye doctor receives from his low vision patients. Driving is an integral part of our independence, going shopping, visiting grand kids, or just driving to socialize with your friends. Since central vision loss effects the drivers ability to see small objects such as traffic lights or stop signs, which can limit their ability to drive safely. The concept of Bioptics is take small binocular telescopes which magnify the smaller objects by tilting your head to see. Visit our macular degeneration page for information about the different forms of the disease, treatment, exams, and prevention tips. Due to the age of the patients, the effects are particularly traumatic, therefore it is vital to visit a specialist to help the patient understand the full range of options to help them retain their independence. Click here to learn more about JMD. Take the first step to a Better Life with Low Vision and call an IALVS low vision optometrist today. 844-332-0202. Researchers at Brigham and Women" s Hospital and Harvard Medical School followed up on 38,022 women during the 10 years after data had been collected on them for the Women's Health Study. Does your lack of side vision leave you missing out?Afraid of accidents or walking into people?Concerned about your safety?There is help…Peripheral vision problems mean that you don't have a normal, wide-angle field of vision, even though your central vision may be fine. Moderate and severe cases of peripheral vision loss create the sensation of seeing through a narrow tube, a condition commonly referred to as "tunnel vision." Symptoms of peripheral vision loss also can include difficulty seeing in dim light and decreased ability to navigate while you are walking. · Glaucoma· Retinitis pigmentosa· Eye strokes or occlusions· Detached retina· Brain damage from stroke, disease or injury· Neurological damage such as from optic neuritis· Compressed optic nerve head (papilledema)· Concussions (head injuries)*If you suspect you have lost peripheral vision, Schedule an appointment with an International Academy Of Low Vision Specialists Optometrist for a comprehensive eye exam that includes visual field testing. Side Vision Awareness glasses may the solution. Side Vision Awareness Glasses™ (SVAG) were developed by Dr. Errol Rummel of Jackson, NJ, after years of treating people with stroke-related,or brain injury related hemianopsia (side vision loss). Dr. Rummel is Director of the Low Vision Care Center, Jackson, NJ, is the Director of the Neuro-optometric Rehabilitation Clinic at the Bacharach Institute for Rehabilitation, Pomona, NJ. And is a Fellow of the International Academy of Low Vision Specialists. Patients who have had a stroke or traumatic brain injury, may lose one half of their side vision to the right or left. This type of side vision loss is called" Hemianopsia" (hemi field loss). Patients who just have a hemianopsia are aware of the side vision loss and often can be easily taught to scan their eyes in the direction of the hemianopsia, in order to compensate for the field loss. This allows them to not miss things on the side of the hemianopsia. "Neglect" is the inattention to, or lack of awareness of visual space to the right or left and is most often associated with a hemianopsia. The lesion in the brain causing neglect usually occurs in the right frontal-parietal lobe, resulting in a left side neglect. Some patients just have a hemianopsia with no neglect, but others may experience a lot of "neglect" and may be unaware that they can not see to the affected side. · Can not or does not readily/spontaneously scan into the area of the hemianopsia. · Tendency to orient head or body turned away from the neglect, and the patient may ambulate/drift in direction away from the neglect. IALVS optometrists have successfully treated hundreds of patients who have hemianopsia. These custom made "Side Vision Awareness Glasses" allow an immediate increase of about 15° in side vision awareness. This helps reduce hemianopsia-related safety issues and enhances the patient's performance of many activities of daily living. "Side Vision Awareness Glasses" were developed by, Dr. Errol Rummel, IALVS member. July 2015 - Is Macular Degeneration Hereditary? The Optometrists at International Academy of Low Vision Specialists (IALVS) are dedicated to helping patients achieve and maintain good eye health. – especially during sports and outdoor recreation. Tens of thousands of sports and recreation-related eye injuries occur each year. The good news is that 90 percent of serious eye injuries are preventable through use of appropriate protective eyewear. This month, the healthcare community is working to raise awareness of the importance of preventing and treating these eye injuries. Protecting your eyes from injury is one of the most basic things you can do to keep your vision healthy throughout your lifetime. The proper eye protection is especially important if you are suffering from Low Vision. Often, such injuries are 100 percent preventable if the proper eye protection is worn. If you suffer from Low vision, contact an IALVS Optometrist today for a low vision exam for an individualized recommendation to ensure the safety of your eyes. From People Magazine March 7, 2015 - She has been a big star for decades and is accustomed to being the main female lead in movies. But sometimes Dame Judi Dench, 80, has much bigger scripts than her costars for another reason – her eyesight. Dench, who revealed in 2012 that she suffers from macular degeneration that can lead to blindness, says that she has the typeface enlarged so she can read scripts. "So, if six of us were coming in to read a sonnet they'd all have one piece of paper and I'd have two or three," she tells PEOPLE in the magazine's new issue. Chuckling, she adds, "They'd think, 'why does she have a bigger part?' when it's all the same! While a diagnosis of Age Related Macular Degeneration (AMD) can be devastating, like Judy, with proper diagnoses and treatment, you can still do the things you love. A special thanks to our Low Vision organization, The International Academy Of Low Vision Specialists http://ialvs.com/ialvs-blog/ for the content of these blog posts.